1. I coloured my hair. I mean to touch up my blonde colour as usual, but I went to a different hair stylist this time, and this is the result after something like three hours of colouring. First they made it a mousy brown-blonde, to which I objected. This was the best they could do to fix it. 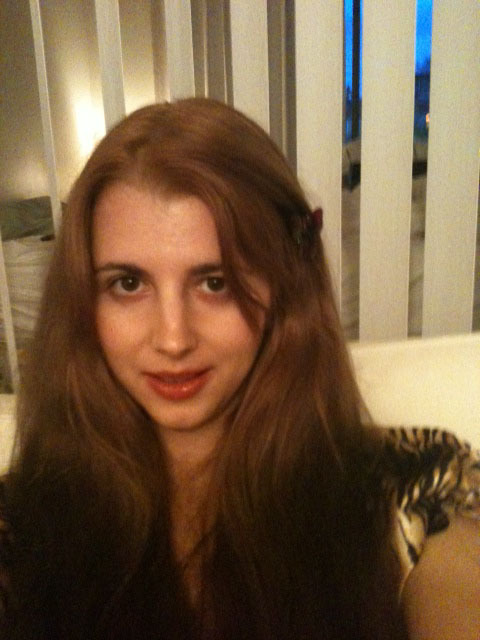 At first I was shocked to see my hair suddenly turn out to be orange, but I’m kind of starting to like it. What do you think? 2. I signed up as an extra for a movie called Evil Feed, described as “an over the top, laugh out loud, action gore flick that’s guaranteed to make you cringe.” The scene I was in took place in a restaurant called the Long Pig (all the staff wear creepy pig masks), which serves fine cannibalistic cuisine, and I was portraying one of the “high-faluting, decadent business people” who frequent the restaurant. Unfortunately, we didn’t actually get to eat any people in our scene. All we had to do was sit around in the cocktail lounge looking decadent and drunk. It was a lot of fun! All the other extras and the film crew were very nice, and the time spent talking to them while waiting around to be filmed was just as interesting as shooting the film itself. There was also a professional pole dancer in our scene, and we all got an amazing acrobatic show while they were filming her. Coincidentally, the last story I’ve written was about a pole dancer, but I’d only seen them on YouTube as part of my “research,” so to see one live was very exciting! So all of these experiences have little to do with writing, but maybe that’s the point. It was good to take a break from the novel and be someone else for a day. Now I’m back to writing with fresh ideas… maybe another exotic dancer story?